Growth, sporulation and spore revival jointly determine the fitness of many bacterial species. For good reasons these processes have been studied separately in the past. Our latest study suggests that it is time to consider the life cycle in its entirety. In B. subtilis both sporulation and spore revival occur heterogeneously across populations. 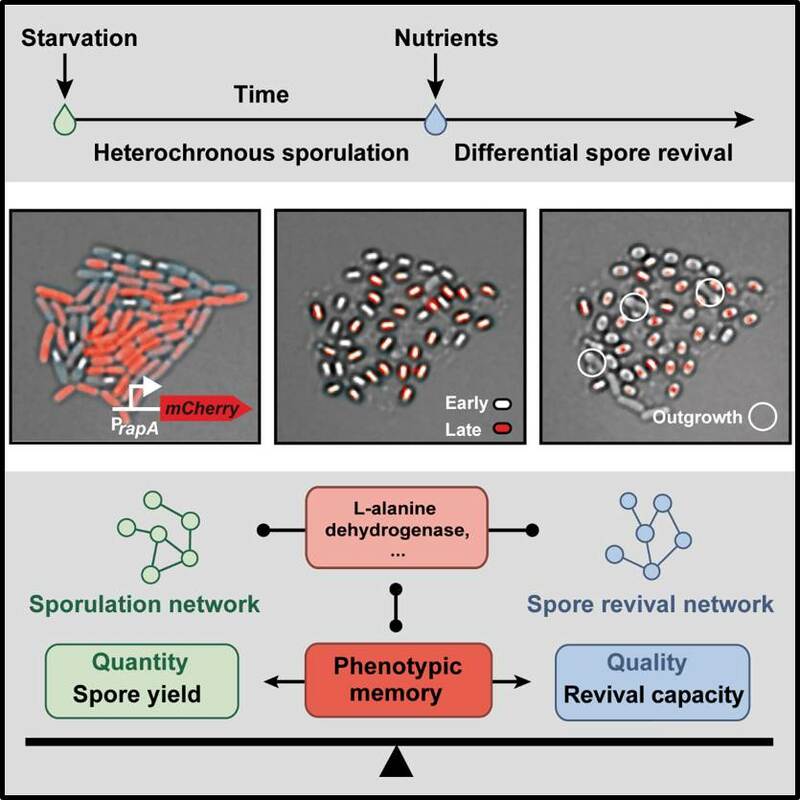 While aiming to understand heterochronic sporulation in microcolonies, we wondered - originally as a side project - whether sporulation timing affected spore revival. Indeed, it turned out that spores which formed early revived much better than spores that were formed later. This correlation surprised us since the initiation of sporulation and revival is controlled by two independent regulatory networks. Yet, late spores might as well simply be defective as they were formed under harsher conditions. We thus focused on elucidating the underlying molecular mechanism of this phenomenon. Due to a lack of tools for a systematic analysis, our best bet was to take educated guesses. As L-alanine commonly triggers revival, an obvious candidate to investigate was a metabolic enzyme utilizing this nutrient, the L-alanine dehydrogenase Ald. We were lucky: artificially expressing Ald in cells that would form the late spores restored the spores’ revival capacities, indicating that delayed sporulation did not fundamentally constrain spore fitness. So how do spores ‘know’ when they were formed? We could show that spores have a phenotypic ‘memory’ arising from the carryover of Ald from the vegetative cell into the spore. During early microcolony expansion, cells produced Ald, presumably as they utilized the remaining alanine in the medium for growth, and then stopped its synthesis before the first spores formed. In this way early spores received many enzymes, which they could utilize to power outgrowth. Late spores ended up with lower enzyme levels as a result of ongoing cell divisions that progressively diluted the enzyme prior to sporulation. Probably Ald is only the tip of the iceberg and additional factors contribute to a spore’s phenotypic memory, since a considerable portion of a spore’s proteome is known to be synthesized prior to sporulation. Sporulation affects spore revival via phenotypic memory but is the reverse also true? Indeed, on the timescale of evolution, spore revival could influence sporulation behavior due to selective pressures. The reason for this is a tradeoff between spore quantity and spore quality. This tradeoff emerges as a result of phenotypic memory, as suggested by both theory and a set of laborious experiments. In analogy to plant seeds and fish eggs where quantity-quality tradeoffs drive adaptations to different ecological niches, more responsive (i.e. high ‘quality’) spores might be selected when nutrient upshifts are rather weak, hence driving evolution towards a more rapid sporulation dynamics. Phenotypic memory could thus link selection pressures acting at quite different times and life cycle stages to produce unexpected connections between states. Investigating the links between different life cycle stages can teach us a lot about how complex adaptive traits arise in nature. As spore-forming bacteria play an important role for mankind, this could enable us to find new ways to control bacterial populations in both biotechnological and medical settings.